BARCELONA -- Pepper the robot is coming to America later this year, first for businesses and later for consumers. After its debut in July 2014, there are now more than 10,000 Pepper robots in use in other countries, primarily Japan. Some are helping passengers find the right train platform at stations in France, and some greet shoppers at supermarkets in both France and Spain. A fuller expansion in Europe is planned for 2016, as well as the U.S. introduction, according to officials at the robot's inventor, Aldebaran, based in Paris. Aldebaran is a subsidiary of Softbank Group of Japan. In that country, Softbank has placed Pepper robots inside Softbank Mobile phone stores to greet and assist customers. Several U.S. companies are considering using Pepper, Aldebaran said, although it wouldn't disclose any names. The humanoid robot speaks and interprets 20 languages and can even entertain a little, busting a move fairly smoothly to the tune of The Loco-Motion, a pop song from 1962.
Business customers will pay $20,000 for a single Pepper, which includes three years of service. Consumers will pay half as much, but won't get the complete range of business functionality. Already, about 5,000 Japanese families have Pepper robots living inside their homes. Businesses will be able to write code to customize Pepper's functions, with a software development kit from Aldebaran. Pepper runs Aldebaran's proprietary operating system called Naoqi. Julien Seret, vice president of enterprise business for Aldebaran, described Pepper as an "emotional" robot, since it can detect emotions of people it interacts with by using facial, gesture and voice recognition. 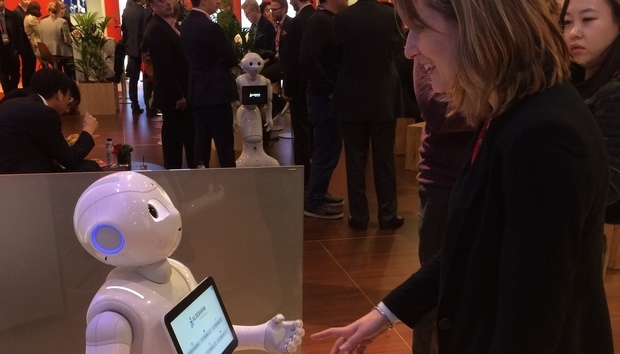 Based on a short demonstration at Mobile World Congress, it was clear that Pepper was reacting at appropriate times to visitors when spoken to. Pepper raised its arms to imitate the gestures of people, slightly nodding at times. When asked a direct question, rings around its eyes lit up, a sign it was actively listening. Pepper also responded to touch with sensors under its white, plastic skin. When patted on its head, Pepper said it felt like a cat. When it was clear the conversation was over, Pepper said, "No worries, have a wonderful day." Pepper will also high-five and fist bump, but its gestures and talk can be customized in many ways. At MWC, Pepper was showing off products from SoftBank subsidiary Brightstar, using a tablet on its chest to quickly present pictures of products. At the end of the presentation, Pepper was programmed to ask a person to take a survey, rating Pepper's overall actions and performance from 1 to 5. After someone took the survey, Pepper revealed how others rated it, as shown on a bar chart on the tablet. Seret said that businesses would be able to use Pepper's survey functions and other human interactions to improve an in-store shopping experience. Compared to online shopping, brick-and-mortar stores actually know little about their customers. Pepper can retrieve information about a product in a store from the retailer's database to offer price and location on a shelf, but Pepper would also be able to conduct a Web search to fill out its responses to customers. During a brief "interview" with Computerworld, it was obvious that the Pepper on display at MWC could respond only to a select range of requests. Pepper also seemed to have trouble now and then hearing over the noise on the show floor and seemed to be distracted when people would walk by. However, Pepper's occasional distractibility seemed a little like the way a middle-school child might act around his or her parent when being given specific spoken directions. Yet at other times during the 15- minute interaction, Pepper was very cogent and responsive and even, well, endearing. Seret said that Pepper's face and overall design were very deliberate. Pepper's face resembles an older child and its height is 120 centimeters -- nearly 5 feet. That height was considered ideal since much taller might be threatening to some people and children, while much shorter would make it hard for people to talk to Pepper when standing. Seret had a part in helping design Pepper and recalled the first time the robots were tested in the lab in 2013. Two Peppers were activated at the same time and almost immediately began to talk with each other, he said. The two Peppers didn't have much of a vocabulary at the time, so the dialog was short. "But it was amazing," Seret said, smiling like a proud parent.